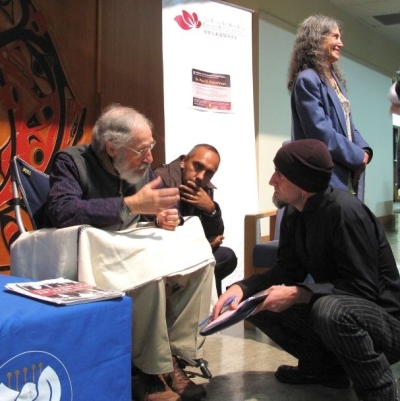 Dr. Paul R. Fleischman gave a talk on “Vipassana Meditation: A Practice and a Path” to around two hundred people at the First Nations Longhouse’s Great Hall on September 29, 2011. He provided an detailed overview of its historical development, philosophical underpinnings, and practical requirements of this meditational practice–stressing its modern systematization and adaptation to modern lives. Dr. Fleischman’s description of meditation was a self-reflective melding of natural scientific theories with the worldview that underlies vipassana meditation. He stressed two points in particular: (1) The natural laws that govern our world also govern us as embodied beings; cultivating awareness of our embodied existence, through concentration and observation, provides insight into the world itself. (2) The practice of meditation is supported by ethical practice, both in terms of basic precepts and the voluntaristic, service orientation of the vipassana movement itself. In addition to being detailed and informative, his talk was imbued with a wonderfully dry humor, making it accessible and entertaining. Dr. Paul R. Fleischman was trained in psychiatry at Yale University and had a psychiatric practice for thirty years. He took his course on Vipassana Meditation with S.N. Goenka in 1974. Along with his wife, Susan, he was appointed Vipassan Teacher responsible for Outreach in the West under the guidance of S.N. Goenka. He is the author of The Healing Spirit, Karma and Chaos, Cultivating Inner Peace, and An Ancient Path. He has also written numerous books of prose and poetry. This lecture is organized by UBC’s Buddhism and Contemporary Society Program. The Program itself is grateful for the continuing support of The Tung Lin Kok Yuen Canada Foundation, and the cooperation of units here at UBC, especially the Institute of Asian Research and the Department of Asian Studies.